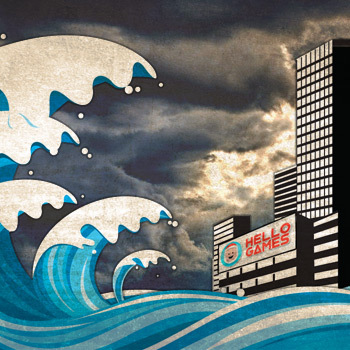 A second flood is closing in on Hello Games' studios, and the developer still manages to crack a few jokes. Christmas hasn't been kind to the folks at Hello Games. Instead of a stocking full of coal, Santa Claus flooded the developer's studio with gallons of river water after he personally destroyed a nearby levy. Well, there's no conclusive evidence that Santa was directly involved, but that dude is shifty. Hello Games' employees spent the holiday cleaning out their offices and lamenting all of their freshly drowned equipment. And even after the claim was denied by their insurance company, the development team was upbeat and optimistic. You'd think that the prospect of a second flood would suffocate any remaining optimism, but you'd be wrong. "Guildford is slowly flooding again," the developer tweeted. "Jokes on them, everything is already really really wet :)"
Before yesterday's weather even had a chance to do any damage, the UK issued several preparatory flood warnings and shut down the area's rail system. Water has slowly been rising in the city of Guildford, where Hello Games is located, but it's not expected to have the same kind of biblical magnitude as last week's deluge. "Damn this second flooding," Hello Games joked. "The Ark still isn't ready, and we only have two of artists and coders... Still need pairs of producers/designers"
Hello Games made a gigantic splash (ahem) during Spike TV's VGX award show with No Man's Sky. Hopefully the repeated flooding of their office space won't result in repeated delays.